Check Your Rankings in Google, Yahoo! & Bing Fast! Would you like to check your search engine rankings right now? No problem. SERPed.net comes with a tool that allows you to check your rankings in Google, Yahoo! and Bing fast. All you need to do is to enter your keywords (up to 25 per check), enter your URL, select the search engine(s), choose how quick you want the results to be delivered and... That's it! You have the choice between having the results delivered within the next few minutes if you are in a rush, or within the next few hours if you are not in such a rush. It is important to note that this tool is in addition to 'Rank Tracker', which is used for regular rank monitoring for your sites. 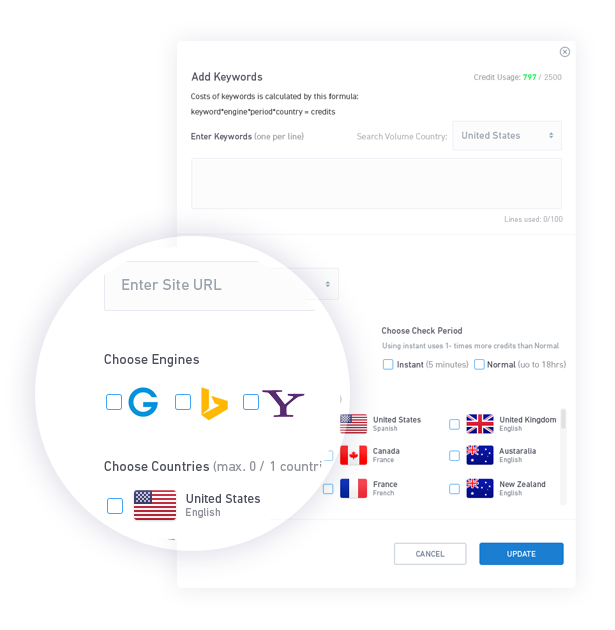 With 'Quick Check', you can check any domain for any keywords. 'Quick Check' can be useful in plenty of situations. Imagine Google just released an algorithm update and you want to know if it had an impact on main your rankings... Imagine you are on the phone with a client, and he asks you where his site ranks for a bunch of new keywords now... Imagine you are considering entering a new niche but want to quickly see how well main competitors rank before you make a decision... That's where 'Quick Check' comes in! These are just a few examples, there are plenty more situations where this tool will be useful.